My abiding memory of the Olympic flame’s visit to York: a man on top of a massive blue bus/lorry, shouting, in Rougier Street. Though it’s not exactly news now, thought I’d post this record of the event, from my rather underwhelmed perspective, along with my usual rubbish photos of the back of people’s heads. 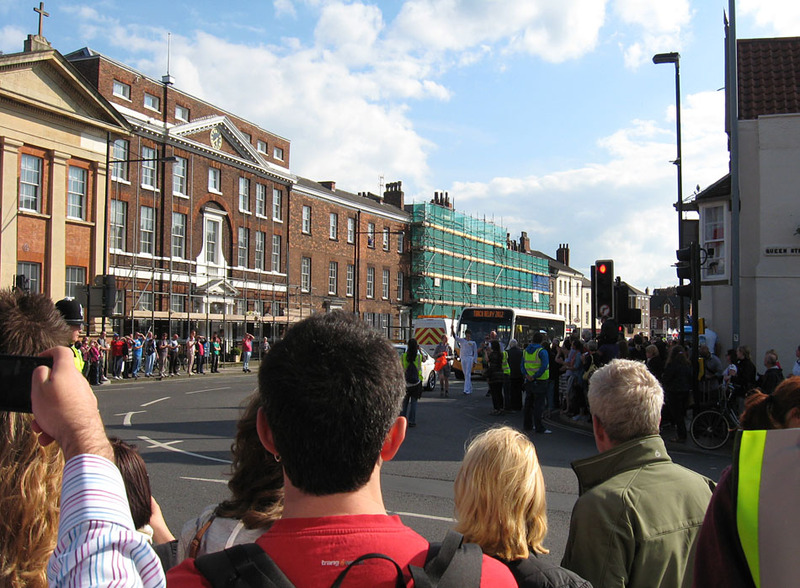 Here we are at the end of Blossom Street, as the torch approaches Micklegate Bar. 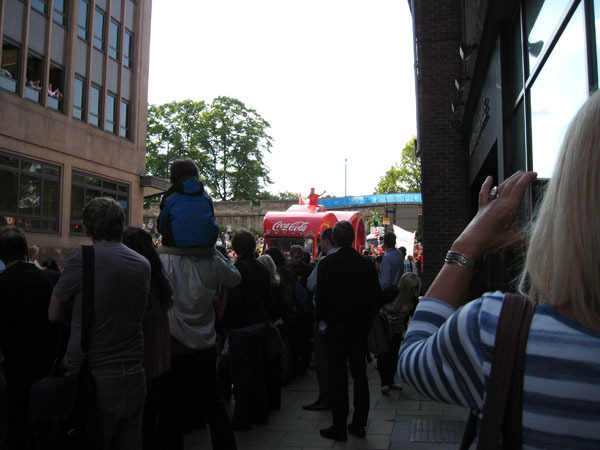 You can just about see the torch-bearer on this photo. Everything seemed to go a bit quiet and I couldn’t see anything interesting happening. Wondered about dashing down Micklegate and trying to get a better look at another location. 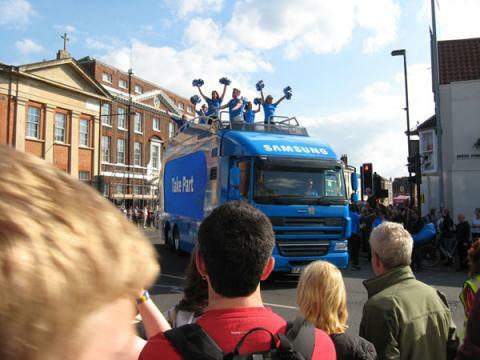 Then this huge vehicle appeared, rather incongruous, looking enormous against York’s rather modestly-sized buildings. 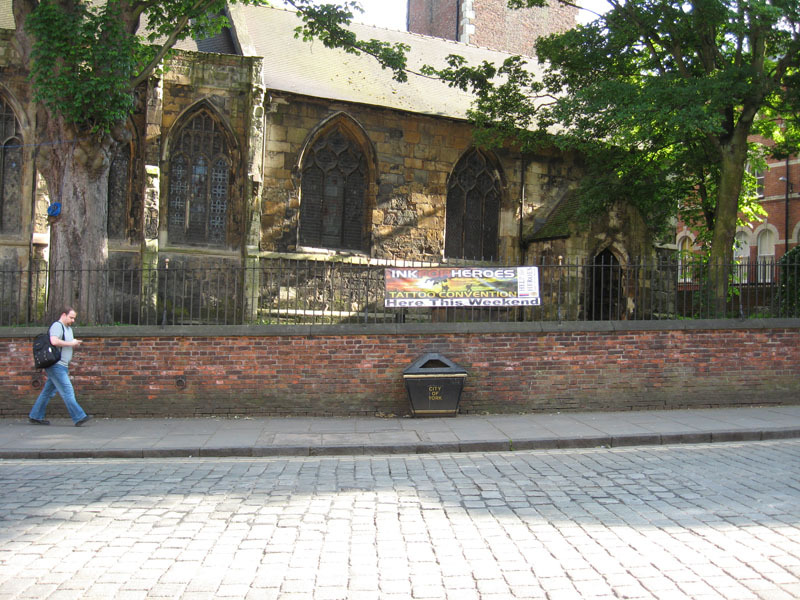 I set off down Micklegate. So did several others. Earlier on Twitter, Micklegate had been recommended as a good place to see the relay. Clearly it wasn’t, it was virtually deserted, as the torch was carried along the nearby walls instead. I meant to nip down Barker Lane to try to see it from Toft Green, but instead ended up on Rougier Street. Which is never a good thing. Past the end of the street, sunlight visible on the city walls, lighting the limestone. But there’s never sunlight in Rougier Street. Workers leaned out of the windows of the gloomy light-blocking offices. Crowds filled the pavements. If the torch went past at some point, I missed it. Then that huge blue vehicle rolled into the shadowy gloom. Brilliant blue shiny thing against beige walls. Possibly one of the least aesthetically-pleasing combinations I’ve ever seen. 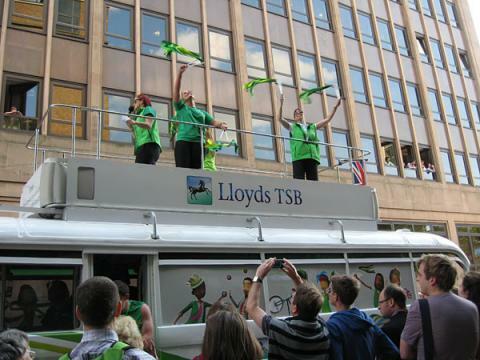 With a team on top of it dancing, all dressed in blue, and a man shouting and whooping at us. I was so busy feeling alienated I forgot to take a photo. The convoy continued … with, guess who … yes, them, the ones who wanted to teach the world to sing. Or give them all a fizzy drink, or something. Anyway, moving on. More people dancing, celebrating a bank. All framed against my least favourite building in York. And forever imprinted on my brain, along with a deep feeling of existential despair. One of the projects I follow on Twitter – Memory Bank – uses old film to unlock people’s memories, in reminiscence therapy. I hope when I’m elderly no one shows me film of this to help me reminisce – it would probably finish me off. 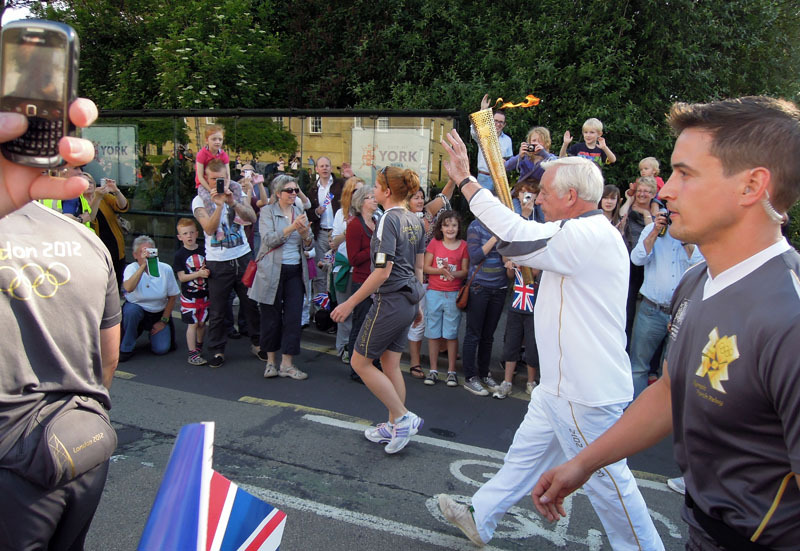 Rather enjoyed the coverage of the torch relay on BBC Radio York, and via the live feed on the internet. 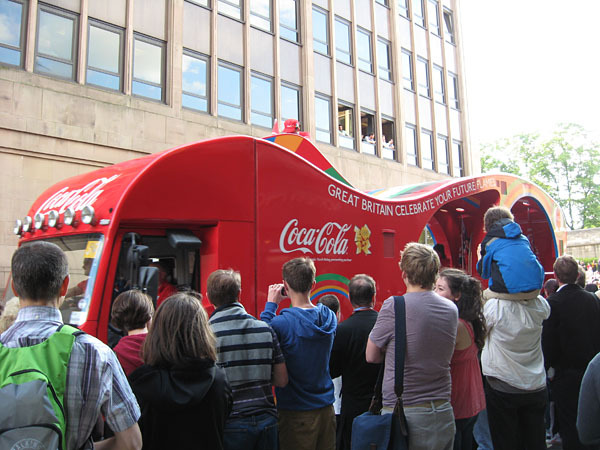 As noted in another page here – Olympic torch relay, via Twitter. This page was prompted by Why does the north remain so unimpressed by the Olympics?, on the Guardian site, and the comments below it. There are some thoughtful contributions. Though my favourite is possibly this response. I’ve heard there are strict rules about what you can say about the Olympics, but I’m not sure what they are. I hope fans of this website will lobby for me to be released from prison if necessary. 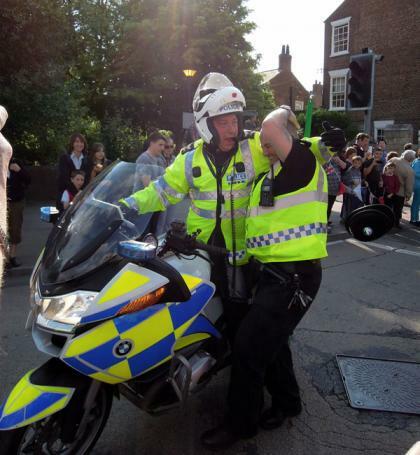 A more positive view from the other side of town, where the jovial police I’d noticed near Micklegate Bar had been captured on camera having a hug, as had the passage of the torch past Clifford’s Tower. Many thanks to @kickstart_bec for these photos. By Lisa @YorkStories • 30 June 2012 Happenings & events To link to this page's proper location please use the > permalink.